3M privacy and protection products work simply and beautifully on most of today's laptops to help protect your screens, and help keep the information displayed on them private. With custom-cut 3Mâ„¢ Gold Privacy Filters, you see your screen with incredibly crisp image clarity, while visual hackers with side views see a vivid golden shield. Display and device technology continues to advance. So do we. Behind the simplicity of our products is a powerful combination of optical science and sheer ingenuity youâ€™ve come to expect from 3M. 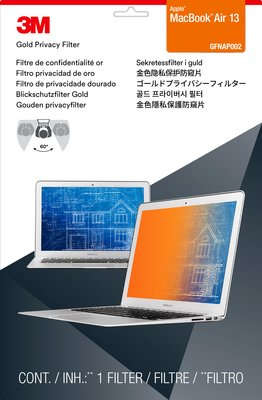 Our privacy and protection products work simply and beautifully on most of today's laptops to help protect your screens, and help keep the information displayed on them private. With custom-cut 3Mâ„¢ Gold Privacy Filters, you see your screen with crisp image clarity and a beautiful high-contrast, high-resolution quality you expect, while visual hackers with side views see a vivid golden shield.